Nineteen people were killed and three more hospitalized after an Mi-8 helicopter crash-landed on Russia’s Yamal Peninsula in northwestern Siberia, Russian Emergencies Ministry has confirmed. 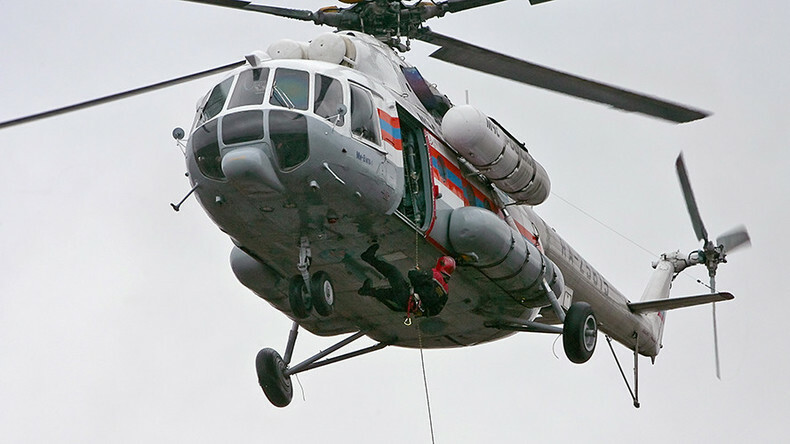 Two black boxes of the Mi-8 have been found by rescue teams “in good condition,” a source told RIA Novosti. Reports from the ground say that the helicopter was badly damaged upon landing and fell onto its side, but did not explode. Poor visibility was being reported on the ground. Earlier, a survivor of the crash reached the rescuers via a cell phone. The man said he was trapped in the wreckage. Two rescue helicopters with paramedics and emergency workers were dispatched to the site, with a total of 140 people involved in the operation. According to recent reports, the bodies of all of the crash victims have been recovered from the wreckage of the aircraft. The three men in the helicopter crew are listed among the dead. The passengers are said to be oil-industry workers. Search and rescue operations at the crash site have now ended. An investigation has been launched under Part 3 of article 263 of the criminal code entitled “Violation of safety rules and operation of air transport, resulting in the death of two or more persons,” TASS reported, citing the Investigation Committee. “The investigation deals with three main versions of the crash of the aircraft: a violation of the rules of operation and flight safety, equipment failure, and adverse weather conditions. None of these is so far regarded as most likely,” the Investigation Committee said in a statement. Criminologists from the central office of Russia’s Investigative Committee will be taking part in the investigation, as well as experts from the Interstate Aviation Committee. Reports of the Mi-8 helicopter crash-landing 80 kilometers northwest of the settlement of Urengoy came in late Friday local time. The helicopter, belonging to the Skol air company, was flying to the Suzumskoye oil and gas field in Russia’s Krasnoyarsk region, TASS reported. The airworthiness certificate of the helicopter, which was manufactured in 1984, was valid until 2017, according to the Federal Air Transport Agency. A day of mourning was announced for the region following the news of the crash. “October 22 is proclaimed as a day of mourning. The flags on [governmental and public institutions] will be lowered, all recreational activities canceled,” the region’s assistant governor, Kudrat Baychibaev, told RIA Novosti news agency. District Governor Dmitry Kobylkin has expressed his condolences to the families of the crash victims.